OLYMPIC FINALIST. GRAND PRIX CHAMPION. AFP PLATINUM AND GOLD EVENT CHAMPION. DEW TOUR MEDALIST. When you talk about natural athleticism, Julia embodies it. Rather than hitting the slopes in late summer and fall this past year, she was a starter on her high school’s varsity soccer team. Her teammates subsequently voted her co-captain for the 2014 season. She is a high honor student to boot and wants to teach mathematics when her professional skiing career is over. This year Julia rolled into Colorado after Thanksgiving to get ready for the Dew Tour. Less than 2 months later she took 1st place at the last Olympic qualifier in Park City and earned a spot on the Olympic team at the age of 16. Funny thing is, when she joined her first freestyle team at age 9, she listed her life sports goal as making it to the Olympics, only for soccer. There’s something about her high school – Hanover High, Hanover, NH – it also gave us Hannah Kearney and Kevin Pearce. While there might be something special in the water, it was Julia’s brothers who got her hooked on freeride. They’d build rails and jumps in the backyard and do flips off the deck into piles of snow. Julia also has a physical and mental toughness that feeds her competitiveness. In the winter of 2011-2012, for example, she broke her leg and then broke her wrist but persevered. At the 2012 Junior Nationals in Steamboat, with a cast molded around her pole, she took 2nd overall in slopestyle. Some call her the dark horse of the Olympic trials, but her path has been building toward success. Moving west to Park City this year certainly aided that success. It would not be hyperbole to say that Julia is part of a young generation who are pushing women’s slope to a new level. Julia competed at the 2014 Sochi Winter Games on February 11 with 24 other competitors. After the first 2 runs, the field will be broken out into a final 12 determined by their high score. Each competitor will have the opportunity to best their score and a winner is determined based on that highest score subsequently. She was able to make it through the preliminaries and competed in the final 12, finishing 11th overall. After competing in Sochi, Julia returned to the United States and competed in The North Face Park and Pipe Open Series at Heavenly which is a Gold rated event on the Association of Freestyle Professionals circuit and won the Women's competition. What's next for Julia for the conclusion of the 2013-14 season? Julia participated in the NINE QUEENS Big Air competition March 26-30, 2014 at Serfauss-Fiss-Ladis, Italy (in the heart of the Italian Alps in Livigno) and competed in the 2014 AFP Tour World Championships in Whistler, BC. Julia placed 5th at the World Championship and finished the AFP World Tour ranked 6th overall. Julia additionally visited with the US Olympic Team at the White House and visit members of Congress during the Spring of 2014 and was honored in Park City, UT in their Olympic/Paralympic Celebration. She had the opportunity to be honored by the New England Revolution (MLS) in May 2014. Julia has been named to the US Freeskiing Rookie Team and will head out west in December 2014. In the meantime, she played high school soccer for Hanover High School (NH) where they won the New Hampshire State Soccer Championship. She will be finishing her senior year which she takes as part of an online studies program that allows her to train, ski and be the best athlete she can be. What is unique in her community is that her online studies has a component to incorporate her with other kids via varsity sports and have the opportunity to be a member of a team sport. This for her has been a crucial component in her development as both a skier and in growing up. In December 2014, she was accepted at Dartmouth University. Prior to the 2015-16 season beginning, Julia began her freshman year at Dartmouth University. With the schedule for school, she was able to complete her first semester before heading to the west for training ahead of the 2015-16 AFP World Tour which will begin for Julia in January 2016. Julia was invited to participate in the Dew Tour, but due to her knee injury suffered in the 2014-15 season she skipped the event as she is on track to return to action just a few weeks later. In December 2014, Julia's first competition for the 2014-15 season will be the Dew Tour in Breckenridge, CO. At this competition, Julia qualified for Finals with the 2nd highest score in the 16 person field and won a Bronze medal in the 6 person final. Podium shot at the 2014 Dew Tour in Breckenridge. When Julia was 3 years of age her mom taught her to ski at Whaleback Mountain, a local, small mountain, in Enfield, NH. Once or twice a week they would ride the magic carpet. Julia’s oldest brother Pierson had and has a passion for freeride. He was a park rat and got Julia hooked. Today they still play games of horse in the park, trying to up each other on rails and boxes. Winter of 2006-2007, Julia and both her older brothers join 2-time Olympian Evan Dybvig’s freestyle team. Evan and 2 partners had bought Whaleback Mountain the prior year. At age 9 Julia started competing in USSA moguls and slopestyle events. April 2008, not quite 11 years old, Julia posted a highlight video on Newschoolers that led to her first sponsorship. 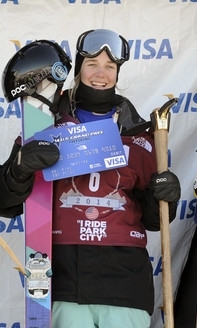 After several years on Dybvig’s team, for the 2009-2010 season she migrated to Waterville Valley and joined the BBTS team. In 2010, at age 12, she placed 2nd overall in slopestyle at Junior Nationals, hosted by Waterville Valley. Winter of 2013-2014, Julia joins Axis Freeride, the Park City based team. In her first year competing at a World Cup level – the Grand Prix tour – she took home a 7th at the Dew Tour, and then a 5th and a 1st place at the final Grand Prix Olympic qualifiers in Park City.